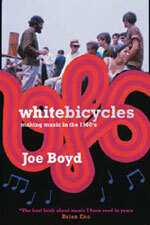 The full title is White Bicycles: Making Music In The 1960s by Joe Boyd – and if you have an interest in the 60s music scene, particularly the later 60s British scene, this forthcoming book looks like being pretty much essential. Joe Boyd was a music promoter, record producer and a man at the heart of the 60s underground. He was co-founder of the UFO Club, the focal point of British psychedelia, alongside John Hopkins before getting involved with the rapidly-growing British folk scene, taking charge of acts such as the Incredible String Band, Fairport Convention and Nick Drake. This book is his story. And there’s seems plenty to call upon. It’s out on May 25th through Serpent’s Tail.